‘Napoléon’ is a classic boardgame of the Hundred Days Campaign. It was first published by Gamma 2 Games in 1974 and the second edition was published by Avalon Hill under license in 1977. The version that we played on Tuesday was a third edition, revised and published by Columbia Games in 1992. 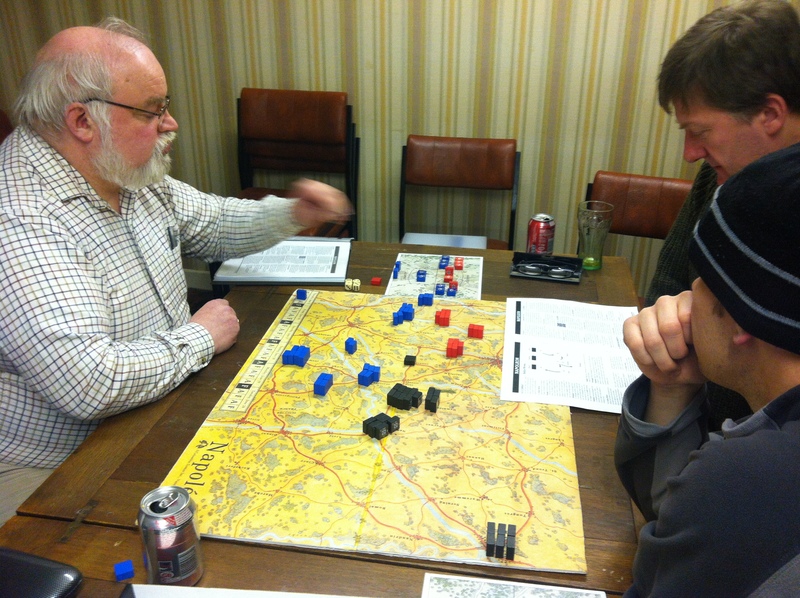 For the 200th anniversary of Waterloo, Columbia Games are printing a fourth edition that will be published in June. The game is played with wooden blocks that have combat strengths displayed on the edges facing the player. These are moved on a board that is a stylised map of NE France and Belgium with a network of major and minor roads that have block limitations. When blocks contest a town or village on the road network, play is transferred to a battle board. The object is to defeat each national army by eliminating 50% of their blocks by battle or in the case of the French, by seizing supply bases: Ghent and Brussels for the Anglo-Allied and Liege for the Prussians. On Tuesday the historical deployment option was used. The Emperor decided upon a variant of the historical plan, sending out a flying column to threaten Ghent to divert Wellington from the centre, while advancing in the centre with his main army up the Brussels axis. In the opening moves, the Anglo-Allied forces retreated before the French vanguard. However, the Prussians concentrated quickly and made a pre-emptive strike at Chalerois. Blucher had out-humbugged the humbugger! The Prussians concentrated their cavalry on the left wing and set up a grand battery in the centre. They were vastly superior in cavalry and it may have been to the French long-term advantage to retreat to Quatre Bras and take retreat attrition losses, but he hoped that his reinforcements would compensate for the initial losses that were bound to result from the all-out Prussian attack. Without his cavalry, Napoleon’s tactical options were limited and Blucher pressed his attack relentlessly. Eventually, the French morale on the right wing crumbled. The Emperor was defeated! Technically, the issue was still in doubt because more than 50% of the French blocks remained on the map but the odds were against a recovery and Napoleon conceded the victory to the allies. Marshal Vörwarts had won the laurels (and some historians would say about time too). 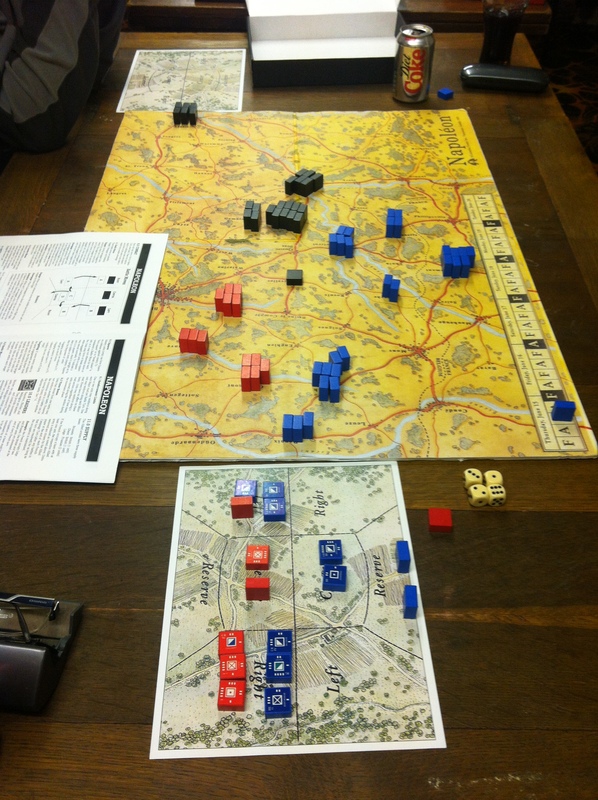 French apply pressure on the British & Allies at Nivelles just south of Waterloo. 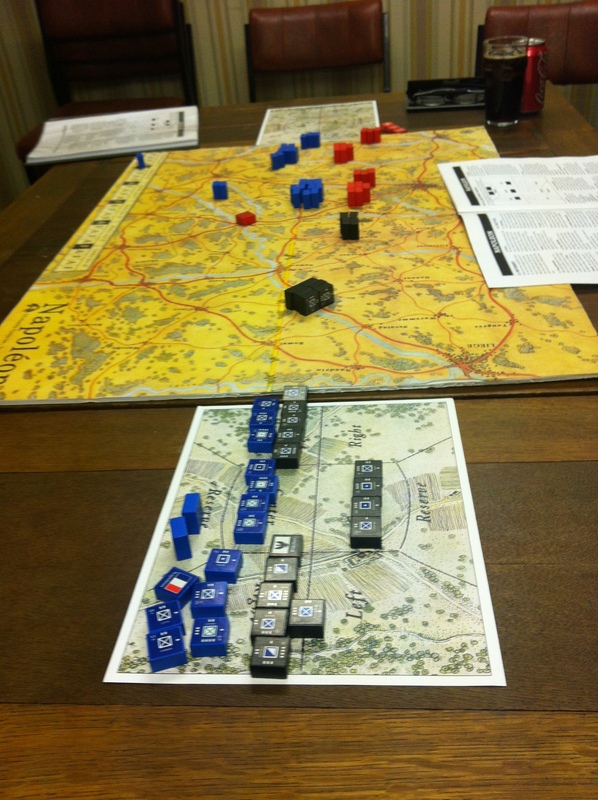 Blucher overwhelms the French forces at Charleroi…. STRATEGIC LESSON: If you split your objectives or make a false attack, be prepared to make retreats as well as advances. If you’re unsure of victory…..RETREAT! TACTICAL LESSON: In an army group ensure that you have a balanced mix of the combat arms to cater for the unexpected. GAME VERDICT: You don’t have to be a Napoleonic buff to enjoy this game. Each deployment results in an entirely different situation with more variables than a game of chess. Although the special board makes battles abstract, it does capture the “feel” of Napoleonic tactics, better arguably and certainly faster than some miniature rules do. There are interesting optional rules of Command Control and Corps Integrity that we have not explored yet. There are no rules for the Imperial Guard in this edition although these blocks are specially depicted, but in the coming 4th edition Guard in all armies have increased firepower (F2 instead of F1). All in all, ’Napoléon’ is a splendid campaign game that can be played in an evening that packs a lot of excitement into a box.